This is the question that should sit at the heart of every major transport and planning decision that’s made in Auckland. I think it’s also going to increasingly become a way of easily describing the goal of Greater Auckland in helping to shape land-use and transport policy-making. In a way, growing Auckland without growing traffic is pretty non-controversial – as I pointed out recently, there really is no viable alternative. If you look back at much of the work done in the original version of ATAP (completed under the previous government), the inability to build major new roads or hugely widen existing ones was up there pretty ‘front and centre’ as a key finding of this work. The changes that would really make a difference, especially road pricing, were essentially about limiting the growth in traffic. I think there is also growing recognition that simply accepting, and then accommodating, traffic growth undermines so much of what we want to achieve with Auckland. Not only do wider and faster roads kill and seriously injure people, but pollution from vehicles is a major factor destroying the planet’s climate and local environment, and the space necessary to accommodate cars when they’re moving and when they’re parked is increasingly valuable for other things (like more efficient modes of transport, public open space, or housing). Growing Auckland without growing traffic means that we get all the benefits of this growth – more and better job choices, increasing diversity and vibrancy, and the money from the rates and taxes from all these new people to use on exciting things that make everyone’s lives better – but without the downside of more congestion, more cars and more of our city being taken over by asphalt to move all those cars around. Importantly, growing Auckland without growing traffic accepts that accommodating, supporting and enabling Auckland’s growth is a good thing. Lots of people want to live in Auckland and, quite simply, for a long time we have not built nearly enough houses for everyone. But it makes us think about how and where we should accommodate that growth – where can we put new housing that won’t increase traffic, or will increase traffic just a little bit and can be offset elsewhere? There’s also a critical distinction here between travel and traffic. Auckland’s growth absolutely will mean more people needing to get around the city – and lots of travel is a good sign of a vibrant and successful place. But how do we ensure this growth in travel – what’s happening ‘at the margins’ in economic-speak – is on public transport, walking, cycling, e-scooters or whatever other forms of space-efficient and environmentally sustainable mobility emerge over the coming years. So how has Seattle managed to pull this off? Well mainly through doing over the past decade exactly what Auckland is planning to do over the next decade – aggressively expand high quality public transport and massively grow ridership levels. Seattle really has followed in the footsteps of its neighbour, Vancouver, in showing how a strong transport strategy relentlessly implemented over a decade or so, can achieve pretty dramatic change. 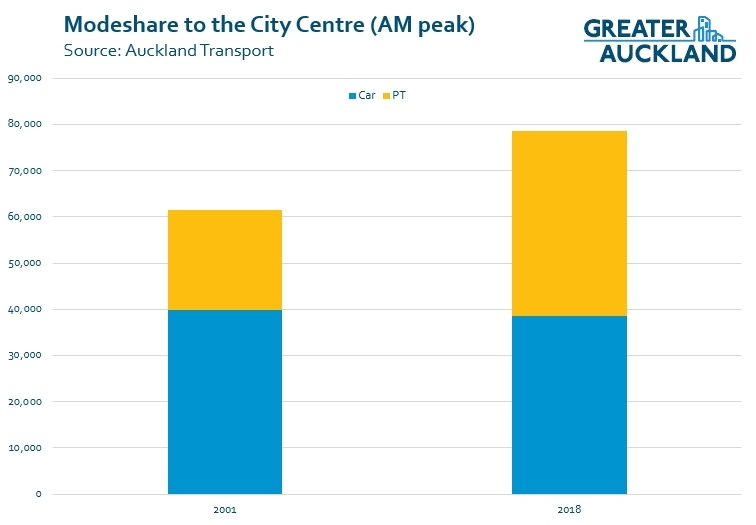 Of course parts of Auckland have seen similar change over the past decade – especially in the city centre. Auckland has pretty good plans in place to follow in Seattle’s footsteps over the next decade. Major investment in rapid transit, cycling, bus priority, safety and much more – including a light-rail system that will probably look pretty similar to Seattle’s. Yet despite these plans, traffic is still expected to increase in the future – although not as fast as the population. This means there’s more to be done, as increased traffic will mean more congestion, more people dying or being serious injured on our roads, more environmental destruction and ultimately less space for everything else. Working out how to grow Auckland without growing traffic – just like what Seattle has done – is a key project for us in 2019. We hope you help us on the way. Good post, but I hope you see the irony there, Matt. “Yet despite these plans, traffic is still expected to increase in the future”. Traffic is expected to increase because they are modelling an increase in trips from new growth areas, planning new and widened roads, and refusing to accept that the roads and the growth into those areas are inducing the increase in traffic. If instead they were to model an increase in trips between existing land areas, plan PT and active mode infrastructure to accommodate that increase, and accept the growth in ridership and active counts, we wouldn’t be seeing that traffic increase. We’d also be saving a whole lot of money that could be put directly into the development of wasteful infrastructure like carparks into housing. I wonder if Auckland Port will shift to Marsden Point. That would free up some land for apartments or housing. Also I suspect if it does a large portion of the industrial and distribution function that is situated in South Auckland will move to the Waikato to be closer to the more efficient port and rail line to and from Tauranga. That could free up a lot of industrial land to be converted to housing. If jobs move south people will follow them. I can’t see Auckland Port ever moving to Marsden Point. The reason Tauranga is more efficient is it is NZ’s largest export port therefore has significant import capacity, this has allowed the shipping lines to offer relatively cheap import costs meaning it can compete with Auckland dispite the distance. As Marsden Point grows its export capacity and rail lines are improved it will inevitably become a player in the Auckland market but I don’t think it will ever be a big one. I agree but New Zealand first is keen but to me it doesn’t stack up. However a significant proportion of the freight landed at Tauranga is being sent and unpacked into storage in Auckland then sent back south by trucks and trains. So that is why I can imagine this industrial manufacturing and distribution function being done in the Waikato.and its only a short run up the motorway to Auckland. It might cut out some of this endless criss cross of trucks we have to get all the materials into the right place at the right time.Do that somewhere else and only bring the finished goods direct to the retailer or end user..
Another thing is some of the warehousing in South Auckland is only fit to be knocked down. I was in one before Christmas which was appalling leaking roof uneven floors the walls and supports had being given a thousand swipes with a forklift and the electrics were just dangerous with wires and junction boxes suspended in mid air. And the plumbing best not to go there. Knock them down and start again.start somewhere else and free up a bit of space for housing.. And they have got all those lovely roads down there courtesy of Steven Joyce’s and his RON’s. Generally agree, I think it is something that will happen more frequently over time. At this point though more imports come through Auckland than Tauranga so it probably still makes sense to have the distribution centres in Auckland. I’m starting to wonder if better use of buses is the quickest and most cost effective solution. Instead of light rail to Airport, why not carry the NEX up Albert/Mayoral/Upper Queen/Dominion/SH20 to airport. Give it proper priority (24×7 bus lanes). Use Hybrid buses that are electric in the city and charge and run via diesel on the motorway and busway. Lets say this costs 300m all up – that means we could do 10 of these BRTs for the price of one LRT, or 20 BRTs for the price of the two proposed LRTs. Is 20 OK solutions in the next 10 years better than 2 good solutions? I’m not sure a new BRT corridor between Mt Roskill and the Airport could be built for $300m. Also the Northern Busway is going to hit capacity at some point and require an upgrade that will be very disruptive. Eventually this will happen on the Airport route as well requiring an upgrade to LR. While it is not the quickest solution, I fully support the current government’s approach of getting it done once and getting it done right. Fully agree regarding hybrid buses, this is a quick solution that could reduce pollution and noise in the CBD and other town centres. I shouldn’t have used the term BRT – I really just meant dedicated bus lanes on existing roads, maybe upgraded in sections over time. Were you thinking of using local roads or the motorway south of Mt Roskill? Local roads would probably be too slow to make the service worthwhile south of Mt Roskill. AT and NZTA specifically looked at BRT before settling on LRT for the airport. It proposed a mix of double deck (for local Dom Road services) and articulated (for airport services) IIRC. I don’t have the report in front of me but my recollection is that one of the main arguments against was the sheer number of buses required. And of course the articulated buses in particular took up so much kerb and road space that it was considered impractical. So a busway is fine to service the North Shore but not airport? Well its not, thats the point. It will hit capacity down the line and with Labour and Greens both commiting to Congestion Free Network 2.0 the busway will eventually become LRT when an additional crossing is added. Take a walk along Fanshawe and see the pile of buses trying to get into town and you’ll see that Busway is just delaying the inevitable. That many buses on a busway just about works. Dominion road can’t fit a bus way, so you’re comparing apples and cider. Ong term basically none accepts that brt will be up to the task on the shore, but for a number of reasons (including the cost of a new harbour crossing) BRT is a much better stopgap on the shore compared to basically anywhere else. No, it should have been light rail from the beginning but can you imagine the opposition back then? The biggest challenge for growing cities, like Auckland, is how to organise them wrt land use, consenting rules, infrastructure provision, parking management and road charging rules etc so that new and existing residents maximise the benefits from accessing the wider city (access to a large labour market needed to pay for city amenities, specialist health and education services, retail opportunities….). Automobile dependence and car congestion clogging up roads and parking spaces definitely limits access -so is sub optimal. Being able to grow a city without growing automobile traffic because residents have multiple transport opportunities is therefote very helpful. Another aspect that limkts access is housing affordability. Peter Nunns has shown that a large number of kiwis leave our cities due to unaffordable housing and this has a big effect on NZs GDP. City biilding arrangements that systematically lead to unaffordable housing are also inequitable and borderline corrupt. They benefit richer and older residents and are a burden for poorer and younger groups. Planners and city building policymakers need to consider all the factors limiting access not just traffic effects. If all Auckland does in the city building space is copy Seattle and Vancouver then it is a massive missed opportunity because neither of those cities are affordable. They both impose massive accessibility limits on poorer and younger residents due to unaffordable housing. There does appear to be a some linked problems here. Improving options to SOV transport, undoubtably improves overall amenity. This manifests itself an increase in desirability, that drives accommodation prices up. The very considerable challenge is to find, and implement ways to build more dwellings at faster rate then that amenity is increasing. Options are limited to using less land per dwelling, and improving funding and construction efficiency and costs. All will involve a lot more government intervention against the trend of declining government intervention of the last 70 years. Unfortunately having a political party that is prepared to implement this change in direction is only useful if that party is in power. The threat of losing the next election, and the huge amount of change required, heavily constricts what can be achieved in any one term. Yes being able to build housing faster than amenities would greatly benefit NZ cities. That way improving amenities boost the city economy not the capital values of a few existing property owners. I do not think we have ever got our head around that problem. National have always been dismissive of the contribution that cities can make to the NZ economy. Labour have responded to raw political pressure from their constituents in Auckland and Wellington but have not articulated a pro-city economic boosting stance. This coalition government has been incredibly slow on removing zoning restrictions on intensification that would boost housing growth where amenities are improving. The goverments big move on the city land use front. The trick up Phil Twyfords sleeve is his new Ministry of Housing and Urban Development. This Ministry will oversee a new Urban Development Authority that has all the powers of local government and organizations like Auckland Transport. It will amalgamate HNZ build programme including its subsidiary HLC that master planned Hobsonville and the Kiwibuild masterplanned build initiatives. Announcements were made last November and December about this new Ministry but given its ground breaking powers very little media attention has been given to describing and analyzing what it will do. In the paper today National MP Stuart Smith had a clearly articulated but wrong in my opinion that the opportunities in NZ are out in the regions. That this is the solution to housing and jobs etc. While Labour MP Deborah Russell defended her patch in Auckland with a correct but poorly articulated message. There was nothing about the increased productivity of cities, more employment opportunities, better education….. Deborah said Kiwibuild was slow but no clear analysis why and what the coalition government are doing about it i.e. buying off the plans initiative has been slow but master planned developments undertaken by the new Ministry of Housing and Urban Development shows great promise. I am really surprised that Greater Auckland has not analysed the issues around Kiwibuild slow start or looked at the new land use policies coming out from the Ministry of Housing and Urban Development. These will affect accessibility in Auckland through the housing affordability channel as much as transport infrastructure does. Really housing and transport need to be considered together. Anyway I have made a bit of an effort to write about this in the context of asking what sort of attributes the new Kiwibuild boss needs. Great blog post Brendon. I’d love to write (a lot) more about housing this year, currently hamstrung by time priorities. But hoping to write more myself as well as widening the circle and getting more people involved, I know we’ve had a lot less on housing recently! Thanks for the kind feedback John. For many of us your starting premise is just simply wrong.Why would our ambition be just to not grow traffic? Surely the aim should be to decrease it? That congestion is costing Auckland $1 billion per year suggests that we shouldn’t just continue as we are. Auckland Council has a city mode share target of 25% by 2046. Given that there will be huge rail capacity increase post CRL, amongst other things, shouldn’t that target be by 2026? The current demise of increasing traffic is due to the fact that AT has completely unambitious targets – the current 4-5% PT increase is rubbish and Lester Levy seems to acknowledge that in the last Annual Report. Let’s have a discussion about transformational change. Rising or falling car traffic use is the wrong goal. For cities the goal should be improving access to city amenities (the wider city labour market, educational and healthcare amenities, recreational and consumption opportunities etc). As part of this goal car use should not be subsidised relative to other more space efficient transport modes, as that will lead to a suboptimal amount of accessibility. So if people are prepared to pay the true cost of roads then Auckland should keep building them? The problem we have at the moment is for most people the only business model they can use fo function in our cities is to use a car. 70 years of car dominance has given people few choices. Ceating a genuine level playing field will be difficult. Walkable neighbourhoods with rapid transit are relatively few and very pricey. So a reasonable argument is that new affordable neighbourhoods based around an expanding congestion free network need to be provided first for equity reasons before the likes of congestion charging is introduced. Hence the need to analyse how afforsanle housing and initiatives like Kiwibuild work with rapid transit. Your proposition sounds like a recipe for endless sprawl to me. I also struggle to see the equity. Let’s take the example of the Shore for a start. The average house price in Sunnynook, which is reasonably well connected to the city has an average house price of about $1.0 million. Houses in Millwater are much more “affordable” because you can buy a brand new house for $1 million. Millwater, because of the distance from the city has much less PT connection. What possible rationale can there be for this new “affordable neighbourhood” to not pay a road toll for the 32km to the city? If they don’t who will pay the price of their commute? The Weekend Herald referred to the “super commuter”: people who drive from Thames, or Warkworth, or wherever; choices perhaps made because they are cheap housing locations. I think it is a more reasonable argument that Auckland seeks to discourage sprawl by putting in place measures that if you want to drive endless distances then you should reasonably expect to pay the cost of it. Our city will evolve, as it is now, with development occurring around PT routes. Better economic outcomes will occur because housing decisions will be made by people looking at all the costs of their decision. No that is not what I said John. I think it is unreasonable to charge low income people in places with poor public transport like south and west Auckland high congestion road prices when they cannot avoid paying them. If housing near public transport was affordable so low income people did have choices then ‘fair enough’ I have no problem with congestion charging. So basically Auckland should build the congestion free network with 50,000 affordable kiwibuild houses within easy walkable distance of PT stops. Then when people have genuine choices congestion pricing can be implemented so that people can make the right decisions for their particular circumstances. I’m not sure… I think reduced traffic should be seen as a (positive) symptom not the goal because traffic itself is symptomatic. A city with no traffic, for instance, would be empty. A city with no car traffic is surely still possible but the point I’m making is that the sort of policies which can help achieve this goal are very similar to those which achieve the former. By making the intention to expand without increasing traffic, the focus is on the good part and how the good things have positive symptoms. The lack of ambition is still concerning even from this point of view, of course. “A city with no traffic, for instance, would be empty.” No traffic, or no car traffic? Groningen in the Netherlands has almost no car traffic but lost of bike traffic. Surely that is a win? In Hamilton local roads are showing decreasing traffic volumes, where there is growth this is being feed from outside of Hamilton. The 38% growth in Wairere Huntington come from trades, once building is complete traffic count fall. I am waiting for update of Census data before I try to explain what is happening locally. Keen to see that when you’ve got the census and put your thoughts together, Peter. One thing I always find difficult to understand, and your Seattle graphs prove it, is why are there more cars than people in cities? I moved to Glen Eden last year, and on my good days, have more than halved my commute to work, by bike. However, this morning I came close to being car doored, and every time I ride my bike, there seems to be more vehicle traffic. Glen Eden is well serviced by a train station, but access to that station is not easy for pedestrians. This is another issue that needs to be resolved. Glen Eden has plans to improve pedestrianabilty which will no doubt increase train ridership in the area. Most arguments against public transport revolve around accessibility, “it’s cold, it’s raining, it’s too hot”, the usual “first world” problems. The more dedicated among, as are most contributors to this publication, go to varying lengths to utilise the public system, but for most people only the Devenport trial system would get them on public transport (Devenport is not large enough to justify this trail, it is walkable). Solution Street is building an apartment block in Panmure with no private parking, and some kind of shared ownership of a few EVs (good sponsorship exercise for Hyundai). If the construction boom is accompanied by such thinking, then reducing traffic could be a possibility. But while they are building carparks even in Wynyard Quarter (super serviced by public transport) apartments, then the vision is clearly not there. And yes the port needs to move, that is prime residential floating land, at least until 2030 when a series of tsunamis wipes out the coasts of Tamaki Makaurau. Most arguments against public transport revolve around accessibility, “it’s cold, it’s raining, it’s too hot”, the usual “first world” problems. Wanting to be able to get to work without getting sick is not a ‘first world problem’. But sure, keep treating the public with contempt instead of accepting responsibility that many platforms or shelters aren’t fit for purpose in a city where it can rain, hail and shine all in the same day. People will surely see the error of their ways. Moving the Port will create very little affordable housing for absolutely massive expense. We have bigger fish to fry. Yes, that was interesting blog post. Not sure I think the new Kiwibuild boss should need to be too concerned about the history of state housing in NZ. Otherwise good points raised. There is a difference between state housing as we know it now and state built housing at different points in the past. For instance the first ‘state houses’ were specifically for workers not beneficiaries. It was the Workers Dwelling Act that created the first state houses. So in many ways those early state houses are similar to Kiwibuild. The Workers dwelling Act initiative of 1905 failed to meet its build target. The whys and wherefore of this failure still holds lessons for Kiwibuild now. To forget all those lessons risks history repeating itself…. I would like the Kiwibuild policy makers to be successful, hence the reason I want them to learn from history. 2) Our RMA land use planning rules are inelastic. Urban planners get to write thousands of arbitrary rules without a regulatory impact assessment on each individual rule, or a cost / benefit or cost effective assessment. 3) The RMA needs to be freed up and land use zoning & density controls removed and moved to effects based only (this was the original intent) Far better to price the effects than have thousands of market distorting rules. 3a) This would immediately drive demand for high density around existing train stations and make the ability to develop new lines and stations more viable. Speaking as a Seattle resident who has examined how City of Seattle traffic is measured, and looking at posted spreadsheets of data and past City claims of what those numbers show, I can state with confidence that the claim in the Seattle traffic report that “average daily traffic” in Seattle is dropping is based on measurement of what amounts to a statistical artifact that is not an accurate representation of city traffic conditions. Using raw data covering hundreds of street segments that show way more than the 19 bridge segments that the City uses as a proxy for all streets, I found that City traffic volumes rose by 19% between 2011 and 2014, unlike the no-growth shown on the line graph above. City officials are eager to prove with numbers that traffic is not growing, but this is a misrepresentation of what robust, objective measurement shows. With a population growth of about 30% any reduction in general traffic volumes less then population growth is a bonus attributable to the investment in non car travel alternatives. Arguing, without supporting data, as to whether the road traffic has increased or declined by a couple of percent in the same period contributes nothing to rational discussion. Correction. The alleged data discrepancy is much larger then the couple of percent but still far less then the population growth. I apologise. I am sure this forum would welcome you to post more detailed data to support your claims. A tip of the iceberg indication that traffic data is being cooked by City of Seattle officials is as follows. Look at the representation of Seattle “average daily traffic” in the graph posted above and also in the City’s 2018 traffic report, compared with this graphic from the 2014 report reproduced at https://sightline-wpengine.netdna-ssl.com/wp-content/uploads/2014/04/Seattle-traffic-563×365.png The supposedly same data points covering 2006 to 2012 in the two reports are different. Furthermore, maps showing ADT on all City streets have been suppressed in recent years by Seattle DOT. Finally, it’s well known by taxpayers and travelers that traffic conditions are increasingly more difficult in the City and in the greater metropolitan region, despite growing transit ridership that is not keeping up with population and employment growth. Seattle transport, oft referenced in GA posts as an exemplar model for a future Auckland. But just a fraud, cooked data et al. Thanks for your insight. It’s telling that JW consult won’t actually reference the reports he is talking about and just sends images without context. Also telling that they won’t use the name of their practice on this forum….. Interested to read more about this, if you would care to give us proper links? Have you directly asked for why there is difference in the data points? What do you think has caused an increase of 19% in traffic in 3 years – that’s quite extreme, and worrisome. Do you have ideas for how to reduce it? I’m in process on pulling more raw data from City of Seattle to understand more completely what’s going on. I’ll report back to this forum. I see Warkworth being mentioned.That town, and Wellsford for that matter, are well within the Auckland super city boundaries, which starts midway between Wellsford and Kaiwaka. Interesting post, yest be good to get that PT/active mode share up. Vis a vis the Seattle data that is the basis for the report quoted above that road vehicle traffic growth is flat in the City, I have found via requested data disclosures that the chart said by the City Government to use average daily traffic flows on 19 bridges actually sums flows on 13 bridges, and there is no way that traffic on these bridges can be claimed as a reasonable, representative proxy of vehicle traffic in the City of Seattle. Measuring traffic in the City is of course a challenge, and I have only gotten as far as discovering that the described method used now is inadequate and non-representative. As a Seattle resident, the posted result sure seemed non-representative based on my observations.